The school was held within the framework of the new ESF research network Quantum Geometry and Quantum Gravity, coordinated by John Barrett and Hermann Nicolai - see http://www.maths.nottingham.ac.uk/qg for further information about the network. The aim of the school was to provide an up-to-date introduction to the main research topics of the network, namely: loop quantum gravity, spin foam models, dynamical triangulations, matrix models, and the application of non-commutative geometry and quantum groups to quantum gravity. 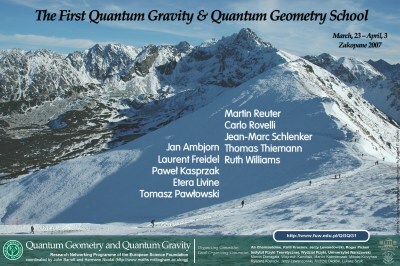 Carlo Rovelli - Where are we in the path toward quantum gravity? See detailed programme of lectures. Photos from QG&QG Zakopane 2007 School (last update: 15.07.2007). 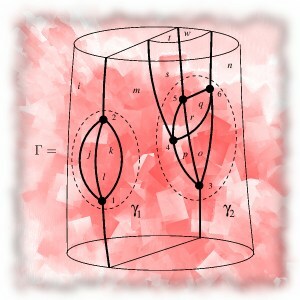 There are also some photos together with the description of lectures on Alejandro's Reality Conditions blog. In case of questions write at qgqg1 @ fuw.edu.pl. The list of the participants (version: 10.04.2007 with e-mails). School's participants were accomodated mainly at Rzemieslnik hotel in Zakopane. Zakopane is a tourist and ski resourt in the Tatra Mountains in Poland. 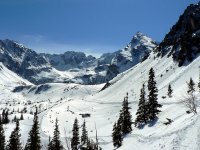 During the school it will be also possible to ski, snowboard (down hill, 2000m - 1000 m) or walk in the national park. For more information about Zakopane see Wikipedia, www.ezakopane.pl, Zakopane-life.pl and Zakopane.pl.